Dish N’ Dazzle is a yearly event where Argentinean wineries come to BC to show off their wines and some local Vancouver restaurants offer tasty bites from their menus. The event supports the BC Hospitality Foundation charity. A few of the wines that were brought for us to enjoy are 2017 Argentina Wine Award winners. Malbecs are definitely at the fore, but there is also Cabernet Franc! I’ve made a mark below in my tasting notes if the wine was one of the award winners. Besides Malbec, Argentina also has an interesting aromatic white grape, Torrontes, which you may want to try if you are tired of Sauvignon Blanc, Viognier, Gewurztraminer, Pinot Gris, and other aromatic white wines. 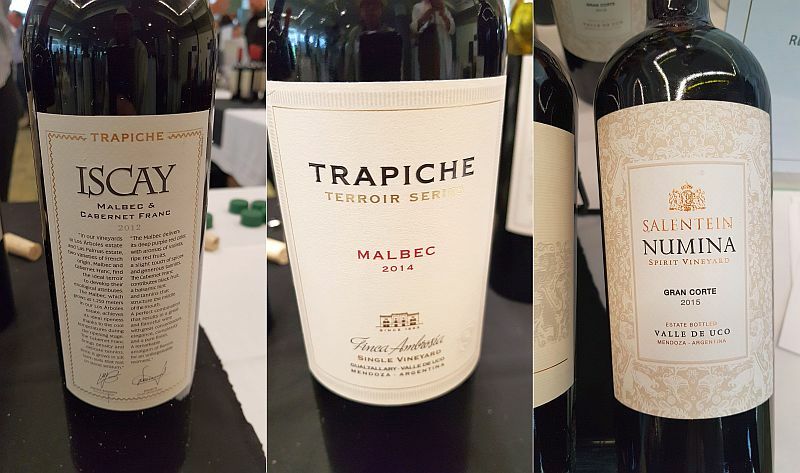 I classify Malbec and Torrontes as treasures from Argentina to try as Malbec has become the signature red grape of the country, and has shown that this grape can produce high-quality wines. The grape is originally from France, but due to its cooler climate could not ripen fully regularly and show its worth. Torrontes is a grape indigenous to Argentina. Enjoy these Award Winners and other wines that I think you should try. Most of the wines are listed as SPEC so they would currently only be found at private wine shops like Liberty, Marquis, and Everything Wine. These wines may be working their way through the BCLDB as well so could be in BC Liquor stores as well. Michel Torino Cuma Organic Torrontes 2017 (BCLDB) – Nice stone fruit nose. Medium acidity. Tasty with flavours of lemons, green fruits, stone fruits, and grapefruit skin. Susana Balbo Wines Crios Torrontes 2016 (SPEC) – Lots of lychees, along with pine needles and peach aromas. Medium body and medium plus acidity. Flavours of lychees, pine needles and stone fruits. Some grapefruit rind on the finish. Familia Zuccardi Q Chardonnay 2016 (SPEC) – Light intensity vanilla and tropical fruit nose. Round and soft with lighter acidity. Tropical fruit, vanilla and oak on the palate together with a hint of sweet spices, and some pepperiness on the finish. Elegant. Pascual Toso Alta Cabernet Sauvignon 2015 (SPEC) – Nice restrained chocolate, vanilla and dark fruit aromas. Full body, round with firm tannins. Lots of black fruit flavours. Quality. Bodegas Salentein Numina Gran Corte 2015 (SPEC) – Nice nose; vanilla, cedar, ripe black and red fruit, and light nutmeg. Full body, round with soft silky mouthfeel. Tannins kick in later on. Vanilla, red fruit and sweet spices on the palate.